After months of hiding your feet away in big Winter boots, it's no wonder they aren't looking their best when Spring rolls around. I thought I'd put a post together about the products I use to get rid of (sorry!) the nasty build up of dead/hardened skin and pump the moisture back in. Don't worry, there are no foot pictures in this post! 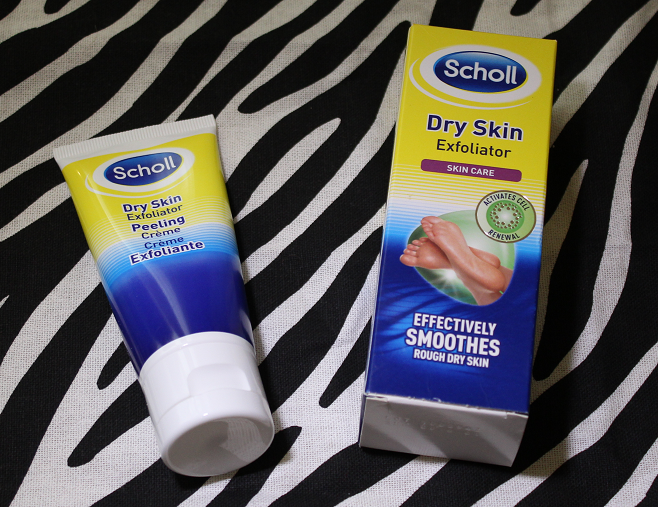 The most effective foot exfoliator I've ever tried is this Scholl Dry Skin Exfoliator (Boots £4.49). It's a thick paste-like formula containing lots of tough scrubby particles which is natural pumice along with some fruit AHA's for extra exfoliation. The instructions say to massage over clean, dry skin and then rinse. I use this slightly differently. I massage a nice big dollop into clean, dry skin but I keep rubbing it in until the lotion almost sinks into the skin but the pumice doesn't. This is going to sound gross but honestly, it's really satisfying... what happens is the dead skin starts to loosen from the foot and it really shows you that the product is working. I obviously advise you to do this over some newspaper or something as it gets really messy. Anyway, I keep rubbing until all of the pumice (and dead skin ewww) is off the foot and I rinse the residue off. You can instantly feel the difference after doing this. The next step is to use a very hydrating foot cream so that it can soak into the lovely fresh skin that have been revealed. I love The Body Shop's Peppermint Intensive Foot Rescue (The Body Shop £9.00) as it's a thick cream that feels very soothing and it smells really refreshing. It also gets extra points for being pink! ;) You will need to pop some socks on after using this as it is slightly greasy but it's not uncomfortable. I need something really heavy duty on this area so I expect a little greasiness. Once the cream has soaked in, paint your toenails a lovely pastel shade to get yourself in the Spring mood. 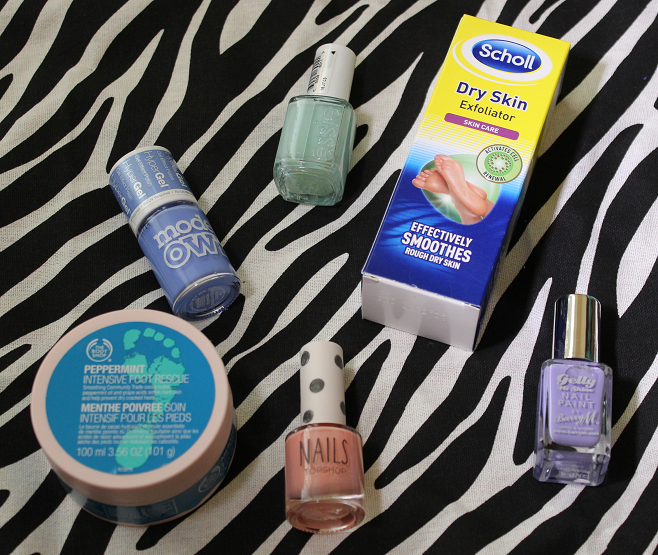 My top picks are (clockwise from top left) Barry M Gelly Hi-Shine Nail Paint in Prickly Pear (Boots £3.99), Topshop Nails in Keepin' It Sweet (Topshop £5.00), Models Own HyperGel Gel Effect Polish in Cornflower Gleam (Boots £5.00) and Essie Nail Polish in Mint Candy Apple (Boots £7.99). Now all we need is some warm weather so we can get our sandals and flip flops out! Do you have a footcare routine? Let me know what products you like to use? that body shop foot cream looks interesting! I have the Mint Candy Apple Essie nail varnish! Love it :) it's such a nice colour!